The United Arab Emirates (UAE) is one of the world’s most lucrative gold markets, and no city more so than Dubai. Known in many circles as the ‘City of Gold’, it’s famous for having extremely competitive and attractive gold trading conditions, which people travel from all over the world to take advantage of. In order to get the best price for their gold investments, many people find themselves asking ‘What’s the gold rate in the UAE?’ In fact, the gold price in AED (United Arab Emirates dirham) is similar to the global gold price. Like in other regions, the gold rate in the UAE is heavily influenced by market trading conditions on a global scale. Political and economic uncertainty have a big impact on the gold price and the gold rate in the UAE is no exception. The price itself is given in the local currency – the AED. It’s worth noting the dirham is pegged to the US dollar at the rate of 3.6725 AED = $1. On a practical level this means that even if the contemporary spot price of gold changes in both currencies, its value in AED will be 3.6725 times its value in the dollar. For a simple estimation of the contemporary trading price of gold in Dubai, simply multiply its price in dollars by the currency exchange figure. Much has been said recently about the introduction of a five per cent VAT on gold jewellery and diamonds. However, it’s vital to understand that this does not cover precious metals traded for investment purposes. What does that mean? Well, essentially the purchase of a bar of gold bullion or certain gold bullion coins is still subject to tax-free status. The UAE and Dubai in particular have long been heralded as investment havens due to the fact that they have little to no taxes. While the introduction of the VAT on jewellery has been a big hit to that market, the investment markets are still going strong and offer plenty of opportunity to both domestic and foreign investors. At Kuber Jewellery we only sell the finest gold bullion and gold coins from internationally renowned refineries including Umicore, PAMP and Emirates Gold. If you’re looking to buy gold in Dubai, we’d be happy to talk you through the gold rate in the UAE and any other elements that could affect your investment. Contact us today to find out more about buying and selling gold in Dubai. The UAE gold rate is recorded in AED – United Arab Emirates Dirham. 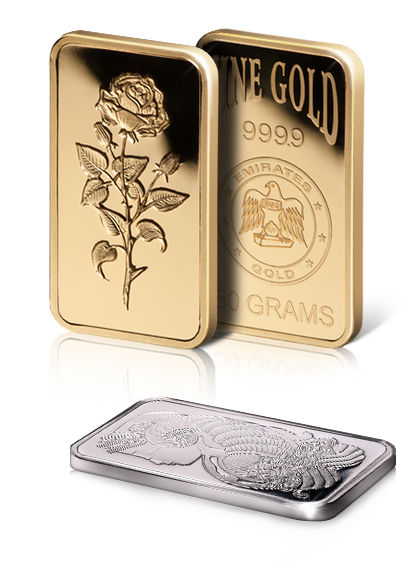 The contemporary gold price in AED is around 3.6725 times its value in the USD. Gold has a long history of being one of the most secure and trusted investment assets. A range of gold products is available. We stock products up to 1kg and also sell silver, platinum and palladium. Not sure about your gold investment? We guarantee that we’ll buy any gold product back. We offer some of the most competitive prices available for gold in Dubai. Visit us and bring your unwanted precious metals like gold, silver or platinum. We’ll test the weight and purity of your items and offer the most competitive quotes available. You decide whether to sell right there and then – if so, we pay instantly.